Benidorm celebrates its patron saint festivals in the month of November. Every year, the second weekend of November until the following Wednesday, the city’s festivities are celebrated during these five days. Some festivals in honour of the Virgen del Sufragio and San Jaime Apostol. During these days Benidorm is dressed in light, gunpowder, offerings and fun. The people of Benidorm gather in groups of friends and family to celebrate the festivities. Numerous popular games to which everyone interested is invited to spend a moment of fun. In addition, numerous music groups, concerts, orchestras… flood the streets with music and dances. Many stalls to buy some artisan details, sweets, sausages … offer their best genre and, of course for children and not so children, fair with attractions to have a good time in the company of family and friends. These Autumn festivities have served with the passing of the years as a tourist attraction. Its consolidation is such that many British book their tickets to coincide with the patron saint’s day because they already know how it looks and have had a good time on other occasions. All this makes the month of November a parenthesis before winter, a month in which is still almost high tourist season. Do not wait another year, come to Benidorm these six days in November and participate in the most open, fun and colorful parties you can imagine. Renting an apartment in Benidorm to spend a few days of vacation is the option chosen by thousands of tourists who visit year after year the city of Levante, spend the holidays of Benidorm in an apartment next to all services and on the beach front. Many are its advantages, but in addition, Benidorm offers unique features that will make your trip a dream. After the summer holidays, many of us are left with homesickness and desire to return to live a few days of rest in an idyllic place to spend a few days of rest and pleasure. Rent your apartment in Benidorm to spend a few days of holidays with us. Altea Dársena offers you apartments on the first line of the emblematic and well-known Levante Beach. If your objective is to rest in an idyllic place with sea views, Altea Dársena apartments is your place. Rent now your apartment at the best price in first line call us! Best location Impossible! Parking Included! Renting an apartment to spend your holidays in Benidorm is the idea that many have for their holiday period. The originality and atypicality of Benidorm is a tourist attraction year after year. For this reason, many are those who are fascinated on their first visit and decide to repeat their holidays in Benidorm. Benidorm has a great success and that is that it is a village made like this, in a matter of 50 years has given a truly spectacular and unique change in Spain. Currently the variety of plans, its pleasant climate and particular make Benidorm year after year triumph being one of the main destinations in Spain. Known for its clean and beautiful beaches, Benidorm is the destination chosen by many visitors year after year, who make the city of skyscrapers their holiday home. Its climate, its atmosphere, the offer of different plans aimed at all tastes make Benidorm an ideal place to enjoy with friends, couples or family. That’s why whatever your idea is, if what you want is good weather, enjoy the sun and the beach, unique views and a unique atmosphere, Benidorm is your vacation spot. Levante Beach is largely the cause of Benidorm’s good reputation. And as we pointed out in previous paragraphs, its beaches are among the best in Europe. Rent your apartment with Altea Dársena, the building is located in a quiet area of Benidorm because underneath has no commercial premises. In addition, in the building inhabits the tranquility and silence so the rest will be in your hand when you want it. Alquilar su apartamento con Altea Dársena es la mejor idea si además de la tranquilidad y el descanso busca divertirse y vivir el ambiente único de la ciudad. Ya que a escasos metros podrá encontrar una gran variedad de tiendas, bares, restaurantes, cafeterías, pubs, salas de fiestas…. Y por supuesto muchos sitios donde comer en Benidorm y chuparse los dedos! Por lo que, en su apartamento podrá tener la tranquilidad que desea y la diversión y el ocio de la ciudad. Los apartamentos se encuentran en el edificio Tor-Maraya, Avenida de Madrid número 4, la ubicación es realmente perfecta para unas vacaciones si desea tener una estancia inolvidable. Nice apartment overlooking the sea But in addition to the good temperatures, Benidorm has beaches that have been awarded year after year as one of the best in Europe. The sand is fine and clear and the waters are calm, so perfect for bathing, being already a common to see waving the blue flag. In addition, the cleanliness is total. We all know how important hygiene is on a beach, all the more so when millions of people pass through them throughout the year. Of their importance are very aware in Benidorm, it is common to see working daily cleaning teams on the beaches. You know, enjoy the good weather in winter in Benidorm, is guaranteed. Recently Benidorm has been a city of joy, music, bands and fireworks. During six days, from Friday to Wednesday we have celebrated the patron saint fiestas of the city. The main object in these festivals is in the fact of honoring the Virgen del Sufragio and the Apostle St. James the patron saints of Benidorm. 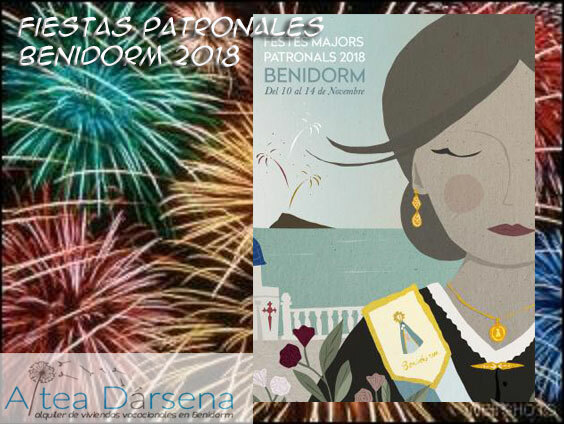 The festival lasts 6 days where there are activities for all ages from football, live music, fishing competitions to cultural events and processions where the residents of Benidorm exteriorize their absolute devotion to the Virgin. It is exciting how the people of Benidorm bring to their Virgin offerings, prayers and other honors. But, it is not only this. During these days, mainly in the center of the city it is impossible to find space and silence. The meetings of friends in rocks are visible, whole families enjoying and mainly the children having fun in the street. At the entrance of the peñas, on the first day, many tourists enjoy the parades and music. Enjoying a whole city in peñas and the festive atmosphere in these days. In addition, there are several musical concerts open to everyone who wants to enjoy them for free. There are several orchestras and bands that run the streets, having the possibility of joining the party as much as you want. In addition, for the enjoyment of children and adults, there is a fair with a variety of attractions and stalls to enjoy typical foods of parties, snacks or buy an item. These dates are ideal for lovers of moderate weather and the coast. In spite of meeting in November, where the cold in almost everybody begins to be a constant, in Benidorm we have enjoyed during these days of terraces and sun. For people who are not allied with the heat, this is the ideal month to come to Benidorm. In our apartments, on the first line of La Playa de Levante, you can enjoy the tranquillity on the terrace of your apartment with unbeatable views, the clear sky and sea water offer a characteristic color at this time of year. Despite being in November, there is no better place to enjoy the sun and sea views than in our apartments. Como es ya reconocido, Benidorm ofrece un clima festero durante todo el año, guardando sus zonas de tranquilidad, como donde se encuentran ubicados los apartamentos Altea Dársena. Pero, por la cercanía y la repartición de las calles en Benidorm, es totalmente accesible, ir a las zonas y al ambiente festero que ofrece esta ciudad en sus días de fiestas patronales. Es por esto que, si quiere disfrutar del buen tiempo, de la fiesta, la tranquilidad y un ambiente de música y color, Benidorm es su sitio. Debes estar registardo para comentar.